Bellevue’s skyscraping eatery Ascend Prime Steak & Sushi is so over the top — flashy and indulgent in both decor and setting — that the food doesn’t need to be. But here’s the puzzling part: This food, from the Japanese wagyu steak to the wagyu beef sushi roll, is so good it would be worth a visit even without the view. To truly enjoy Ascend, a 22,000-square-foot restaurant open since June on the 31st floor of Lincoln Square South, you have to leave all your snark and suspicions at the elevator door. Let your server — all the waitstaff seem straight out of Robert Palmer’s “Addicted to Love” video — give you the “tour” on the way to your table, up a curved ramp (the wall lined with wine bottles), past the gold-tiled room (the only open part of the kitchen, with a custom grill so massive it had to be airlifted into the building). 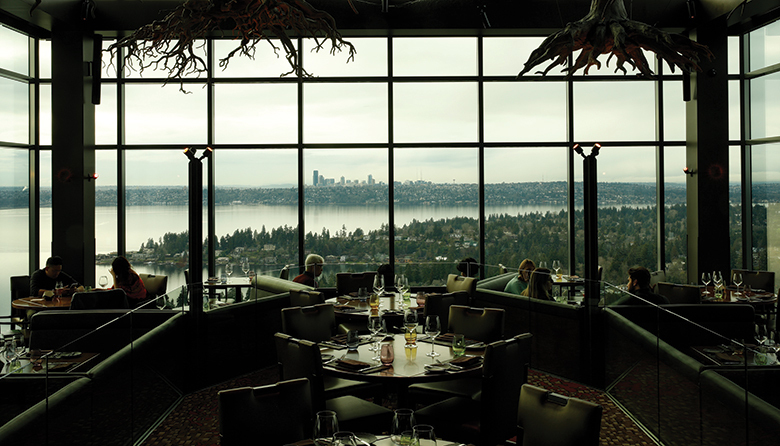 If you’re lucky, you’ll get a seat in the tiered dining room, one of a few different dining spaces, where tree roots (from the five kinds of wood used to impart their smoky flavor in the meat) dangle overhead and a tiny Seattle can be seen from the floor-to-ceiling windows to the west. The lengthy wine list and cocktail selection can be perused via a showy iPad app. Steak is almost a necessity here, whether you order the coveted olive-fed wagyu (in extremely limited supply, $55 per ounce with 3-ounce minimum) or the more modest American prime. 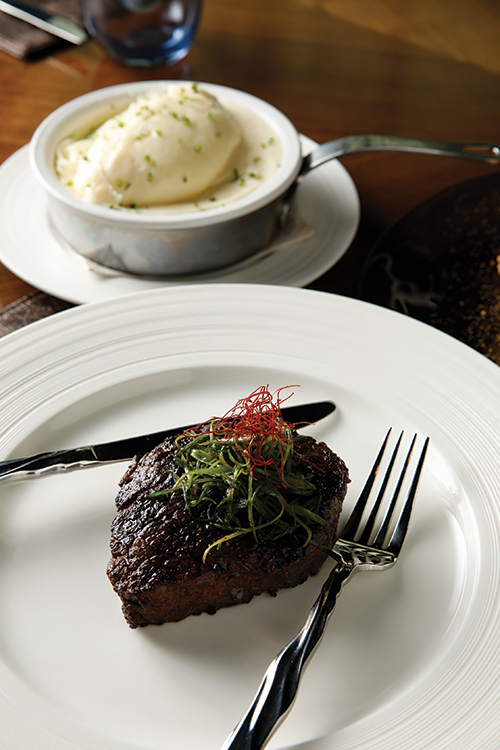 The potato purée ($12), seemingly more butter than potato, needs to be on your table, too. But don’t let the heft of steak house tradition steer you away from the sushi menu, particularly the contemporary rolls. The spicy tuna and prosciutto roll ($36) is a revelation, flavorful and texturally complex. Culinary director Kevin Hee of the Las Vegas–based Elite Brand Hospitality Group (which owns Ascend and the food hall downstairs, in partnership with Ascend Hospitality Group, which is run by Bellevue couple Paul and Elaina Herber), says these unique rolls were developed over many iterations, designed specifically to avoid the “yum-yum sauce and Philadelphia cream cheese” that many people identify with untraditional sushi. From the complimentary bread service — artistry in dough form — to the dry-ice-dressed Skyfall dessert (scattered, delicate bites of panna cotta, blueberry macaron and miso chocolate caramel; $13), the meal unleashes trick after trick, clearly the result of many hours of preparation and a massive kitchen staff. The service — close to the likes of Canlis and Cafe Juanita — makes this dance between kitchen and diner look easy. All of it could so easily be too much, but, somehow, this place pulls off the seemingly impossible: a meal as impressive as that view. Must try: The food is just as good at lunch, and a Restaurant Week–like deal — $31 for three courses chosen from a slightly more limited menu — can be had on weekdays from 11 a.m. to 2:30 p.m.
A version of this story appears in the March issue of Seattle magazine.